From 2nd to 16th of November 2015, you have a chance to win this nice cat condo. It is very important for every indoor cat to have plenty of stimulation and places to explore and that is why this cat condo was made. It features cozy condo two story to hide and play, 5 attractive levels and resting perches for your cat to relax on and 7 scratching posts covered with sisal rope which will prevent scratching of home furnishing. It is also perfect height for perching and looking outside through the window. Full description with the measurements read here. 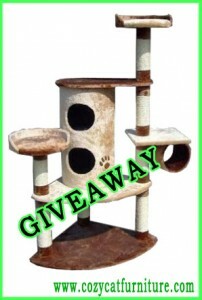 One lucky reader will win this cat condo furniture made with just cats in mind. Just enter the Rafflecopter Draw below. Self Disclosure: No compensation was received to post. I have reviewed a product from this company in the past. This giveaway is hosted by SoCal City Kids but is not affiliated with my website and I do not choose the winner or send out the product.